Former Aspen Times photographer Devon Meyers was able to return to his family's home near Malibu Thursday and found total destruction. A former Aspen Times photographer who maintains close ties to the Roaring Fork Valley lost his home in Malibu to the Woolsey Fire last week. Devon Meyers was able to use a press pass from the Malibu Times to gain access Thursday to his Trancas Highlands neighborhood, which remains barricaded because of the devastation. 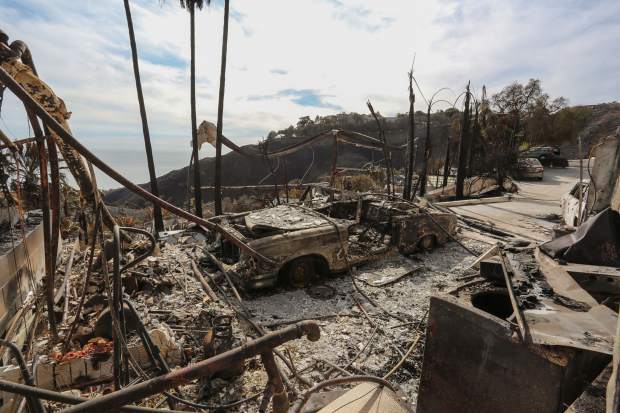 He, his wife and their son were aware that their house was destroyed, but that did little to blunt his emotions as he drove up to the property in a canyon above Malibu West. Meyers worked for The Aspen Times from 1984 to 1994 then moved to San Francisco for a few years before returning to Aspen. He left the Roaring Fork Valley again in 2004 but returns to his family’s property in Paonia for a couple of months each year. He usually performs music at White House Pizza in Carbondale at least once per summer. Meyers has been a photographer for the Malibu Times for 10 years. Both his father-in-law’s house and the Meyers family’s residence in the adjacent guest house were “slabbed,” meaning everything above ground was destroyed. That included the vintage Mercedes he and his wife parked in their garage. He estimated that 20 out of 30 homes in their vicinity were destroyed. While driving to his neighborhood he saw how the fire created a checkerboard of destruction — one house would be spared but surrounded by four that burned. The Woolsey fire burned 98,362 acres and destroyed 616 structures as of Friday morning. There were three fatalities. Meyers, his wife, Lilla Freije, and their son, Tullie Meyers, lost nearly all their possessions. Meyers, a musician and photographer, said he packed his instruments and cameras when they were ordered to evacuate Nov. 9. He also grabbed hard drives with his vast archive of photos. They were focused on getting his elderly father-in-law and his pets as well as themselves out of harm’s way when the call came at 7 a.m. for a mandatory evacuation. They knew the night of Nov. 8 that conditions might force them out. They could smell smoke that night and the menacing Santa Ana winds gusted as fast as 65 mph. Their dogs were unsettled. They didn’t hesitate to move when the evacuation order came in. “We saw the smoke and the armageddon mushroom cloud building,” Meyers said. After loading up for about one-half hour, they joined the caravan escaping via the Pacific Coast Highway. It was a slow, nerve-wracking but safe trip. The important thing, he said, is they got out safe and were able to take refuge with his brother-in-law in another part of Southern California. Meyers and his family experienced a roller coaster of emotions in the days after the fire. One neighbor reported that she saw a drone video that indicated their house survived. That proved to be incorrect. Another neighbor provided a text image that confirmed their house and Devon’s father-in-law’s house burned. “That was rough,” Meyers said of the 180-degree change of information. Meyers said his family is taking the disaster in stride. His son’s high school survived mostly intact, so he looks forward to getting back in the routine. Devon, Lilla and her father are dealing with officials from their insurance company and the Federal Emergency Management Agency while trying to figure out their rebuilding plan. Meyers said he and his family have received an “outpouring of love” from friends and family including several people from the Roaring Fork Valley. He’s kept people apprised of their situation via Facebook. The magnitude of the loss keeps seeping in. “I keep remembering things I forgot” to load up during evacuation, he said. Tops on the list are drawings and paintings his son made starting from an early age.